The two pedestrian and cycle bridges over the Naviglio Grande in Milan, designed by the Lombardini22 studio, have been given the BIM&DIGITAL Award 2017 in the Small Projects category. Lombardini22, one of the three studios that feature in the current exhibition at SpazioFMGperl'Architettura, was given a prize on 19th October at the first BIM&DIGITAL Award 2017, for the design of two cycle and pedestrian bridges over the Naviglio Grande in Milan, as winners of the Small Projectscategory. The award, the result of a partnership between BuildingSmart Italia and Digital&BIM Italia, aims to recognise architects, companies and start-ups that promote digital tools and technology in construction and project management. The initiative particularly helps the spread of Building Information Modeling (BIM), making the process of designing and building, and the later phases of managing and maintaining a building or infrastructure, more effective. 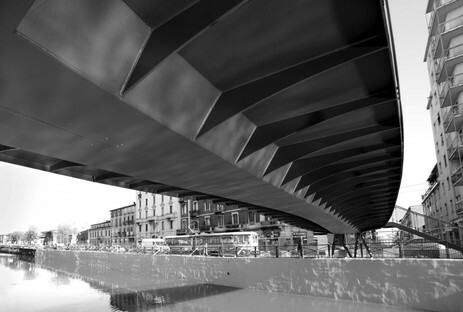 The design of the bridges over the Naviglio Grande in Milan, a commission that followed a 2012 competition by Metropolitana Milanese for EXPO 2015, is an example of advanced design with parametric technology. Each phase of the design, from concept to creation, was monitored and controlled through an algorithm, an operation whose complexity made working on the two bridges at the same time possible, parametrically controlling their general shape and every part of the structure, which can be repeated in other instances. Using the parametric function, the designers had complete control over the shape of the bridge, obtaining an elegant and sinuous design object, as well as an important architectural element that reconnected an area of the city.